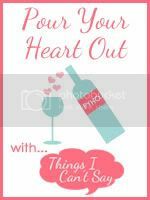 Today, I’m linking up with Shell at Things I Can’t Say for Pour Your Heart Out –AND- with Julia for at Work, Wife, Mom ... Life! for Working Mommy Wednesday! I’m not actually following one of the WMW prompts, though, because I have other things on my mind. I think that all moms, whether you stay at home with your kids or go to another job (outside the home) every day, grapple with whether they’re doing the right thing. And, even when we know we’ve made the best decision for our family, for our particular circumstances, we all probably have times when we second guess ourselves. For me, this struggle comes when my job slows down in the summer, and I have the ‘luxury’ of working from home and having a very flexible schedule. It’s a fantastic situation because it affords me an opportunity to still earn a paycheck while getting to do some of the things that SAHM moms get to do more regularly. During these summer months, I’ve taken Baby to music classes, kept her home from day care a little late to rock her for her morning naps, picked her up early for some extra special Mommy & Baby ONLY play time! I really enjoy these times, and I know I’m lucky. If I worked a traditional 9-5 job, I wouldn’t have these opportunities. However, with this type of work situation, I also run into a lot of guilt. I very often feel like I should be finding a way to keep Baby at home with me all day while I work. I feel like I should be able to balance this stuff a little better, especially since my work load is considerably reduced right now. I question whether I’m being selfish to send her to day care every morning when I know I’ll have at least an hour at some point during the day that we could have spent together. It’s tough! But, since we had Baby at home over the last couple of days while she was sick, I was really able to put things into perspective. Trying to care for your baby, sick or well, is not that easy to do amidst the real responsibilities I have to my employer. I had a couple of important work calls, and Baby either cried or bounced/laughed quite loudly (after her fever broke, of course) through my entire conversations. Having an 8-month-old around is not exactly conducive to the most productive or professional working environment. I see now that it’s important for me to send her to day care. I have obligations and responsibilities to my job that I really can’t perform to the best of my abilities if I’m trying to sooth/play/change/feed/etc. my little girl. And, more importantly, I can’t really give her what she needs when I’m preoccupied with emails/reports/conference calls/etc. It’s a tough pill for me to swallow. I’d love to be able to do it all. But, this is how things work best for my family. (For now.) She thrives in day care. She is socializing and being stimulated in ways I couldn’t provide. Really … my level of fluency in Spanish ends at cerveza. They’ll teach her things I can’t. And, she has fun! There are no other little babies at home for her to play with and learn from. On the other hand, while she’s ‘building’ her immune system (er, working on her 3rd ear infection in as many weeks), I’m able to provide excellent health insurance at a really low cost to our whole family. I’m able to afford those music classes in the summer, something I probably couldn’t do if we were a one-income family. Or, if I worked another type of job, I might simply not have the time to fit in activities like that. It works. It’s hard. But, it works. I don’t think I’ll ever be completely at peace with how things ‘work’ for us, but I’m starting to gain more confidence in knowing that Husband and I are making the best decisions for ourselves, for our daughter, and for our family as a whole. I might always ask the ‘what if’ questions … I think that’s what good parents do. It’s important to constantly evaluate our situation to make sure that past choices are still the best ones for our constantly evolving lives. For now, this is what works for us. And, that’s okay! While I work from home, I could not do it if I had to take calls. That would be impossible, completely. 7 years I tried balance work and kids. It didn't work for us. There were multiple reasons, one of the biggest being it was retail management which has no true consistency for schedules. Major changes occurred and we had to make decisions. Either way we were going to struggle financially, so I decided I would rather be home with the kids. It's what was best for us at that time (and still is). I do hope to return to work part time when my youngest is in school all day(a few more years). I think everyone needs to do what works for their families. Some women work and some don't, but it is okay either way. So long as you tend to the needs of your family, there shouldn't be an real issue with a families decision. I feel your pain! It's hard to leave the babes at daycare when we are at home, but I have learned as you have that baby and work just do not mix. I can enter my reports at home in 1.5-2 hours, and when my babes are home it takes me all.day.long! So they end up cooped up in the house while I am constantly distracted with requests for snacks, and sippy cups, and things that are out of their reach. This summer I decided not to alter our 3 day a week daycare schedule, and it's been the most productive summer in years! Following from Pour Your Heart Out over at Shells! Drat...my comment didn't post. Gah! Take 2: Basically I said I agree, and it's a lesson I've learned this summer that sticking w/our 3 day a week daycare during the summer has made this summer my most productive yet. I just cannot get my work done at home with the kids here. It leaves a lot more time for outings if I take them to daycare for a few hours! Following from Pour Your Heart out @ Shells! Thanks for sharing! It is hard to balance it all and I totally agreed with your statement, "I might always ask the what if questions". It is totally what good parents do! it really sounds like you have found a good balance! good for you!! I always idealize working from home, but I don't think I could do it...without kids even. I'd be too tempted to load the dishwasher, throw in a load of laundry, catch up on the dvr, wallow around in my jammies, you get the idea. Through a baby/toddler/preschooler into the mix and I think it would be downright impossible. I completely relate to the feelings of guilt, but I think your last paragraph is spot on. Hang in there. You *are* doing a great job! I am visiting from Pour Your Heart Out and I've gotta say - you made my heart ache for you. I am so glad I made it through those tough child rearing vs. work years without losing my sanity or breaking my heart. This is a great post. Thanks for literally pouring out your heart. I have walked in similar shoes! It is so darn tough to work at home. While on 3rd maternity leave, I nearly killed myself trying to do it all from home and ended up returning to work a week early. Talk about guilt! You will be in my prayers my friend. Visiting you from WMW (my first week). I think we all strive for the prefect balance when it comes to our kids, whether we work or not. It sounds like you are doing what is best for your family and that's what counts. Visiting from WMW...I agree, balance is always hard to find. I think that every day, you do your best. There isn't any more, anyone could ask of you! this is SOOOOOOOO hard and i know i struggle with it every day. but if you read my post, i also know that what i do is important. like you, my workloads at certain times of the year are different. and when that comes up, i take more time to do stuff with my kids. you are a great mom and doing what is best for you. no child who went to daycare came out not knowing or loving their mom.